New to Texas and full of spirit this homeowner wanted something fun instead of a big lawn. Can you blame her? She brought an inspiration picture of a patchwork of materials that appealed to her. She liked the idea of tucking in low ground covers! We decided to create something similar. I call it the patchwork garden. I put it right off her main path from the driveway. We added a new path from the street going straight to the front door that complemented the patchwork garden. 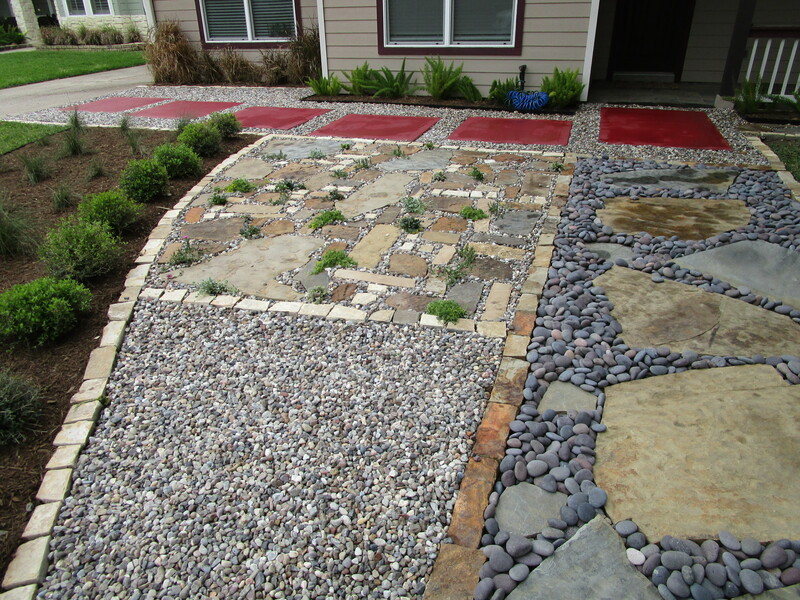 The mix of stone colors and varied gravels is on purpose. The existing path leading to the front door was gray cement and that was too boring for our client. She wanted a red path! Using cement paint we painted it a vivid red. Tile Red PFC-04 Here you see the intersection of the various paths and the patchwork garden. Not the least bit boring now! The home owner came here from the east coast and wanted seasonal interest and plants that attracted pollinators. She has her grandchildren over often and wanted a garden they could run and play in. Shawn must have had a ladder to get this angle. I love all the textures and colors. 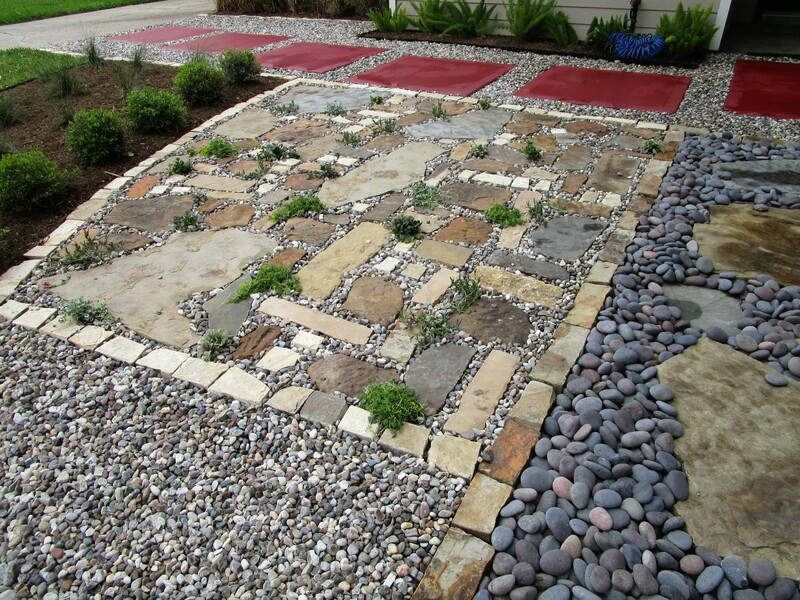 The gravel triangle is a place for the homeowner to put some of her found art pieces. Another angle looking on the patchwork garden. I would love a whole patio like this! We made a seating area for the grandchildren and planted shrubs, grasses and perennials that are low maintenance, predominantly native and good for attracting pollinators. They are designed to give some privacy from the street. We used a mix of mossy boulders to create the amphitheater seating area and flat mossy stackers to make a border between this garden and the neighbor’s yards. This also helped with the slight slope. 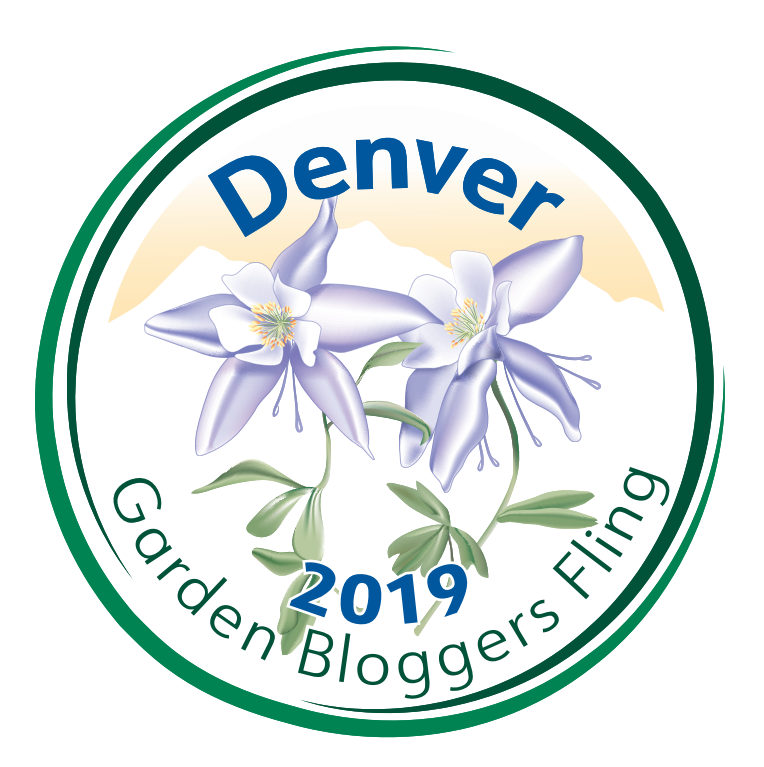 You may recognize the Esperanza Yellow Bell, Purple Montrose Vitex, Adagio Maiden grass. We also have 2 Possumhaw hollies, Bluechip Buddleia and a Texas Mountain Laurel. There are clumps of Louisiana iris and Day lilies to add pops of color. Not too bad just planted and better and better over time. View from the street. The foreground is a field of Purple and White trailing lantana. We used flagstone and rainbow gravel to make a side walk along the street side to allow for getting out of a car and walking to the main path. There is a matching small path that leads to a side gate and doubles as a bed border near the porch. 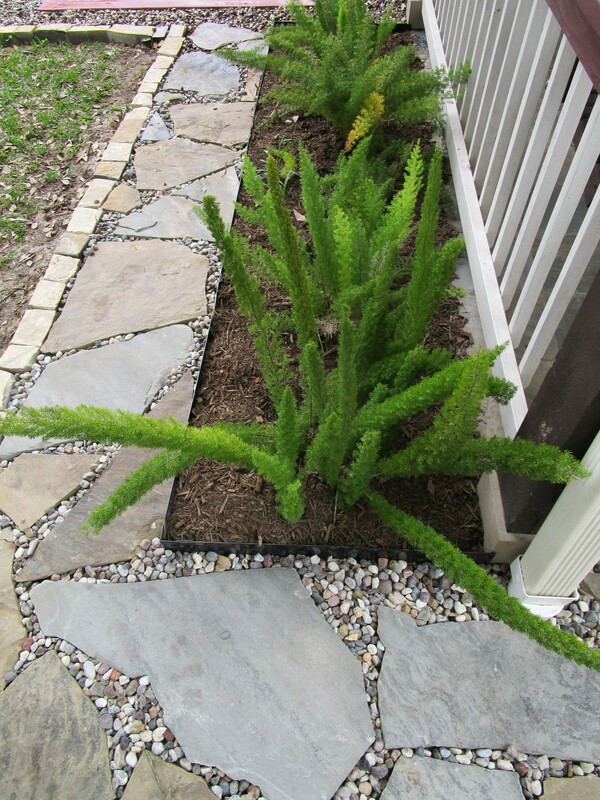 We left the existing Foxtail fern since they were doing well and are nice and bright. View from the west. The strong lines of the path is repeated in the low hedge of Dwarf Yaupons. Planted behind it is a long row of Gulf Muhly grass which will be striking in the autumn. A few close ups after the rain. Don’t you love the reddish beach pebbles? We added little creeping plants in the patchwork garden. Mexican sedum, Creeping Thyme and Ajuga with room for the owner to add more. One of my favorite boxwood substitutes: Dwarf Yaupon holly. This is a dwarf, dwarf called Oscar’s Dwarf Yaupon holly from Treesearch Farms. 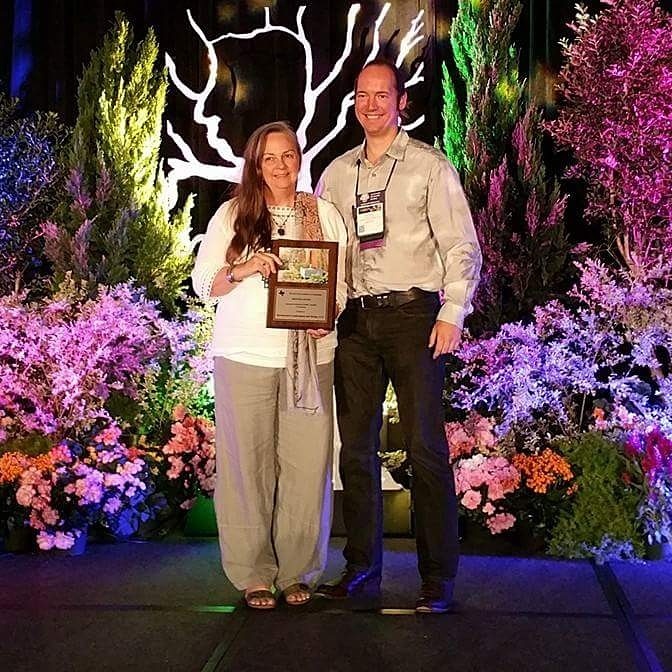 Click the link for the story behind the Oscar’s Dwarf Yapon holly. We went back in January to replace a few lantana after our very hard freeze but really need to go check now that it has warmed up! This plan would not be something that would appeal to me, but your crew does great work and everything looks just the way your customer wanted it to. Thank you Judy, they do execute my designs perfectly. My husband is very good working with stones, picking boulders and placing them. The owner was very pleased. A vast improvement! I like the red-painted concrete. Sounds like this was a fun client to work with. It is gaining character as she finds more bits to add. She was a fabulous client! You all had a good time working out those ground plane patterns in advance, it seems. 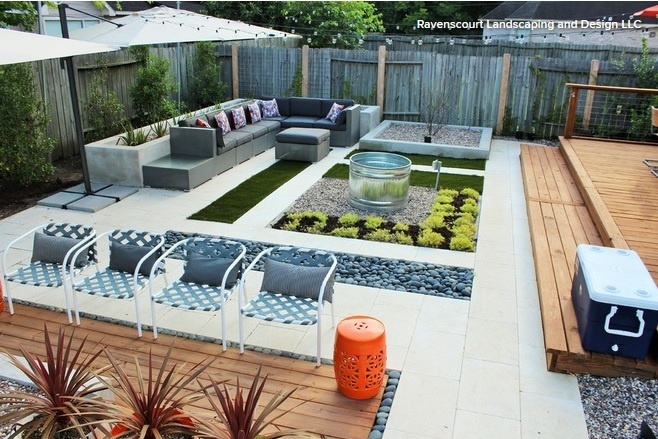 Lawn = overrated!